För några veckor sedan hade vi stickträff hemma hos Emma. Så himla trevligt. Stina visade ett förträffligt tips som är användbart när man stickar sockor. Fäst de vilande stickorna med varandra med gummisnoddar. Detta kan också vara bra när man packar ihop stickningen, så att man inte tappar alla maskor i väskan. Tack Stina för tipset! 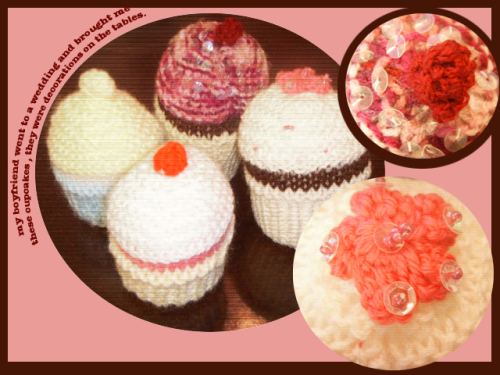 Knitted cupcakes makes me happy. Real ones does to, but the knitted ones last longer. 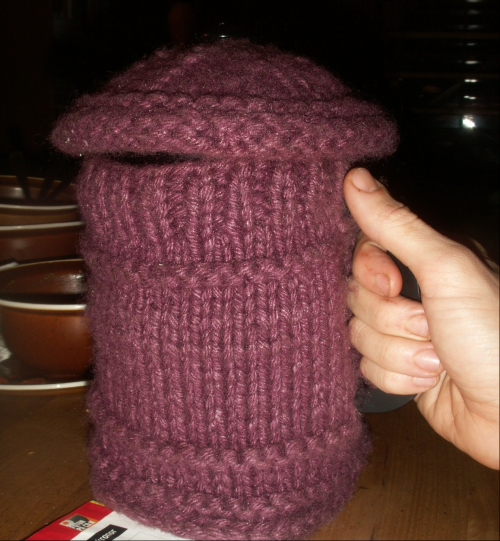 If you want to knit some yourself check this blog. Cast on 60 sticthes. Join the last and the first stitch into a circle, continue knitting until you have 20 rows before you cast off. Then you have the first link of your chain. 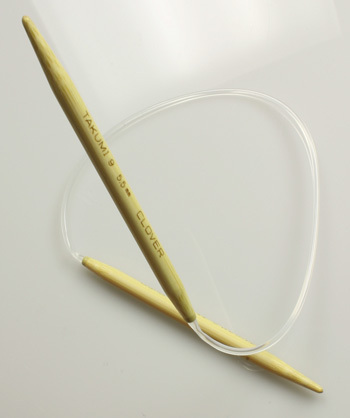 Repeat what you just did but before you join the circle thread the needles through the first circle. Then you just have to repeat the same thing with all circles, linking them through eachother before you join each circle. When knitting the last circle thread through both end circles so it makes a continous chain. It's in knit stitches nature to roll up towards its top and bottom rows, this time it's actually a good thing, hiding the edges. 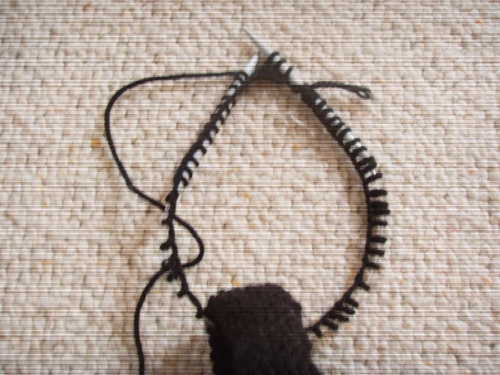 You don't really need to do anything with the loose ends, you can just tuck them into the rolled up edge, but if you want it to be neater you can off course finish them off pulling them through some of the knitted stitches with a needle. I find this necklace/scarf so goodlooking! You can wear it just hanging or wrapped twice around your neck if it's cold outside, could be useful since the summer is a bummer. If you don't have the time to make it yourself you can buy mine. 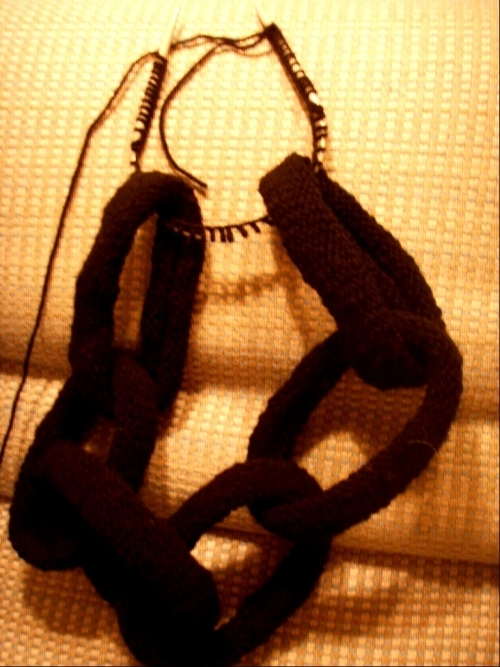 I will be showing some knit projects in the future, so I thought I have to show you how to do it from scratch. Luckily there are plenty of knitters out there that already did. These youtube clips from yarnsnob are easy to follow. And if you don't get it the first time you can just watch over again. You start with a slipknot. Then you need to cast on. 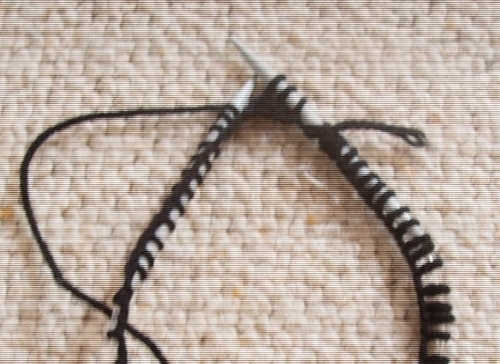 The knit stitch is the easiest one to start with. Since I'm SwedishI knit continental style, I guess it's just a matter of what you're used to. The purl stitch is also needed very often. 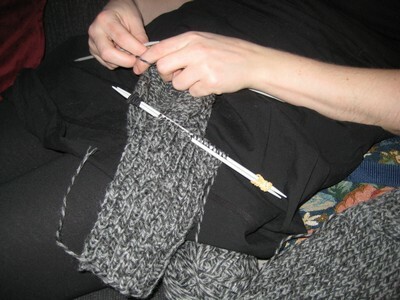 If you have knitted a row of knit stitches you usually knit purl on the other side. To finish it off you need to bind off. There you go, now you know how to knit!